Guinness Nigeria Plc is happy to announce its Guinness Nigeria Undergraduate Scholarship Scheme for eligible undergraduate Nigerian students. The Guinness Undergraduate Scholarship Scheme supports Guinness Nigeria’s commitment to implementing transformative schemes that foster youth development. The scholarship will provide full tuition for students who are currently studying in Nigerian Universities and Polytechnics. Applications are now invited from suitably qualified students who wish to be considered for the Guinness Undergraduate Scholarships. Students from Guinness host communities are encouraged to apply. Shortlisted candidates may be required to provide a letter of introduction from the Chairman of their Community Development Associations where applicable. .
Guinness Nigeria, a subsidiary of Diageo Plc of the United Kingdom, was incorporated in 1962 with the building of a brewery in Ikeja, the heart of Lagos. The brewery was the first outside of Ireland and Great Britain. Other breweries have been opened over time – Benin City brewery in 1974 and Ogba brewery in 1982. 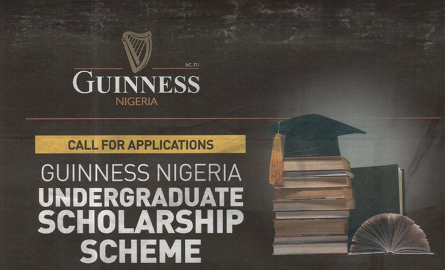 Previously a scholarship for its hosts communities only, the Guinness Nigeria Undergraduate Scholarship is now extended to all Nigerians.